Every plumber knows that not all clogs are created equal. That is why choosing the right Drain Cleaning Cable will make sure you get the job done fast, easy and painlessly. But the amount of cables available can be overwhelming. No-core? Inner-core? Sometimes the decision on when to choose a particular cable type is not always crystal clear. Nevertheless, by relying on your experience and knowledge, you can be sure you have made the right choice. There are a few considerations. First, the type of building and pipes you are working with will be the main factor in determining what drain cleaning cable you should use. Is this an industrial area with larger pipes and a bigger plumbing system? Your best bet will be to use inner-core cables. Because drain snakes function similarly to a spring, the added weight that an inner-core cable can offer is a considerable bonus. These are ideal in situations where you have a large clog in a large pipe. 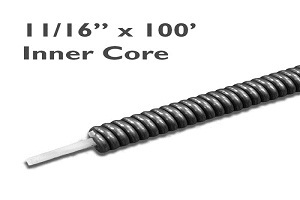 Inner-core cables use a layer of material wrapped around a solid core that adds torque and tension to the drain snake. As the snake is sent through the pipe, it is flexible and loose, but when it impacts the clog it will become stiff and able to break it apart. In those situations, a heavy-duty inner-core cable will be needed to get to the clog and add the required pressure needed to break it up and let the water drain as it should normally. However, sometimes, when working with smaller pipes in a residential building or house, you need flexibility and lightweight material to navigate the small twists and turns. A no-core cable is perfect here in that what it lacks in strength it makes up for in its ability to wind through just about anything. With smaller pipes, the clogs are smaller and you will not need much strength to get it free again. In certain cases, such as when working with two-inch pipes, plumbers can even choose between no-core and inner-core and determine for themselves what kind of solution will work best. Now that you have picked out the right drain cleaning cable, make sure that you are using it safely and efficiently. The first step is to unbind the coiled cable, but, be warned, once the cable ties are undone, plumbing cables may spring open due to the pressure they are packaged with. It is very important that plumbers and contractors are aware of this and that they perform this task in a safe manner with the right amount of space and caution used. Next, you must attach the cable to your machine by connecting the male and female ends of the cable. You can then feed the cable into your machine’s drum. It is also important that anyone handling a rotating cable wear the proper equipment. Safety glasses are recommended but what is essential is wearing riveted cable gloves. These gloves are specially designed to protect the hands and fingers when a metal cable is rotating with the machine. At the end of the drain snake, you will find that there is a place for attachments to connect. These can be retrieval hooks, blades, or any number of devices that assist in unclogging the pipe. Be sure you choose attachments that have the proper connection to your cable and always keep safety in mind when operating. At Duracable, we take pride in our advanced knowledge and expertise. We are happy to help you find the right tools and equipment you will need for your next plumbing job and our experts are here to help guide you every step of the way! For more information about Drain Cleaning Machines and Drain Cleaner Equipment Please visit : Duracable Manufacturing.